The Cortinariaceae is a vast family with some 600 European species recorded. It is a tricky group to categorise, and precise identification is fraught with difficulties. Many of the species can vary greatly in size and colours, making microscopic examination a necessary step in the identification process. 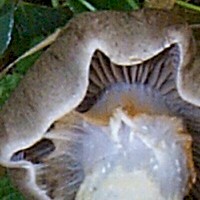 A partial veil covers the gills of nearly all young Cortinarius fruitbodies. The veil, which joins the edge of the cap to the stem, nearly always consists of fine cobweb-like strands and is termed a 'cortina'. In some species the cortina is fleeting, while in many others it remains intact until the fruitbody nears maturity. When the veil breaks, the cortina often clings to the stem and catches falling spores; in so doing a rusty ring is formed around the stem, and the shape of this ring can help in identifying certain Cortinarius species. Very few Cortinarius species are valued as edible fungi and several are known to be deadly poisonous. 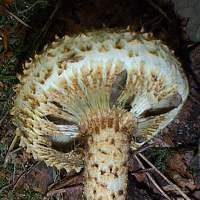 In view of the identification difficulties with this group of fungi, most people who collect wild mushrooms for food prefer to steer well clear of all Cortinariaceae. All fungi within the family Cortinariaceae leave brownish spore prints; with fungi of the genus Cortinarius, for example, the colour of spore prints is a distinctive rusty brown. Following, wherever it is practicable to do so, the BMS - Classification System, we have included the Strophariaceae and Bolbitiaceae in separate galleries rather than incorporating them here with the Cortinariaceae (as many fungi field guides did in the past).